Hello everyone, previously I shared some of my experiences with the beginnings of my treadle sewing machine career. As you recall I said I was trying to incorporate some of my vintage sewing machine experiences into the antique sewing machines. For the most part there wasn't much difference between the treadle sewing machine and the early vintage motorized sewing machines, In fact some of them came out as optional, motorized or treadle, from the factory. But as the sewing machine evolved and the technology changed, so did some of the simple skills that we all take for granted, how they feed the material. 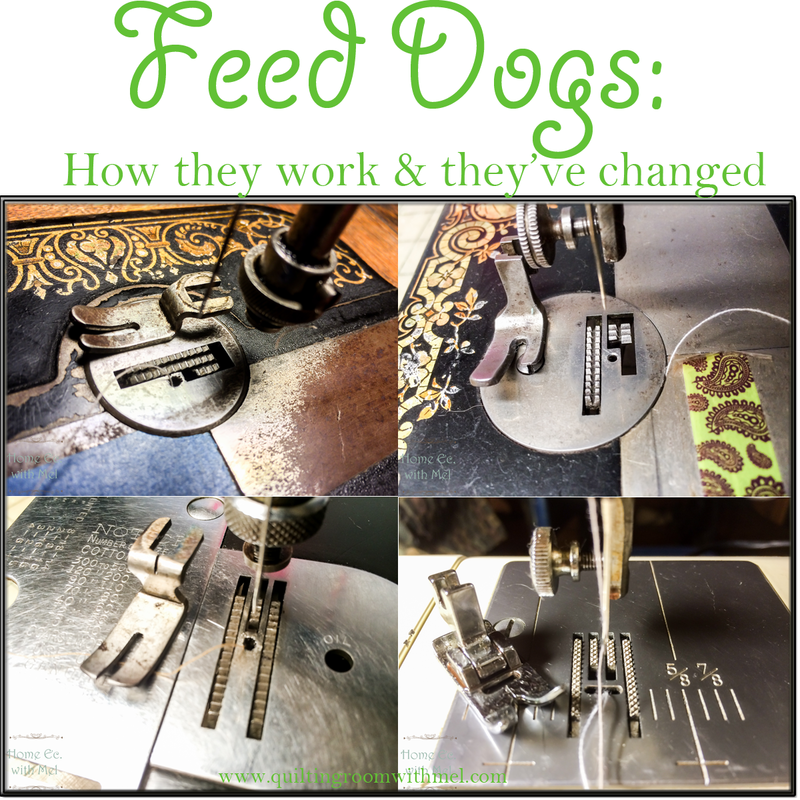 Over the years the feed dogs have changed and with that how the fabric moves under the presser foot has changed. 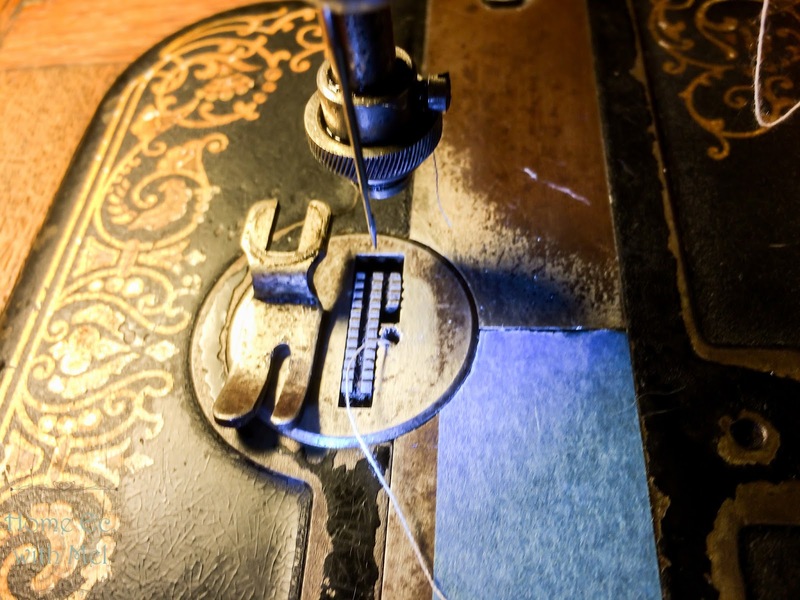 My first memories of sewing machines come from watching my mom and my grandmother sew when I was 4-5 years old. That was in the mid late 60's. I understand now that when my grandmother was sewing a lot she did so because it was an economical advantage to do mending and make clothes and she was a typical housewife whose job was to be a homemaker. Sewing for her was part of her (JOB) she was good at it but her passion was crochet and knitting as a hobby. My mom also sewed, she enjoyed sewing but the economical aspect was being phased out with the availability of cheap clothing versus the expense of sewing clothing at home. As more and more women were migrating into the workforce the (JOB) of housewife/homemaker was changing and in order to continue to help the family economically housewives found them selves working for a paycheck as well as managing a family,So for many years as I grew up my mother rarely sewed because there just wasn't time for her to enjoy that hobby. I was always fascinated with sewing and in high school in the early eighties I learned some sewing skills in a home economics class,none of which I ever intended to use because I was only in the class because I had to have the credits and the girls, Fast forward through the years I rarely sewed while my kids were growing up.They were teens when Mel and I got married and they each formed their own relationship/friendships with Her as they finished school and grew into adults. Mel comes from a family who all sewed, Her mom was a custom quilter with her brother in-law,Mel's uncle. Mel's dad was railroader who sewed nights and weekends so my interest in sewing really didn't surprise anyone. Starting out on more modern sewing machines and not being a sewing machine mechanic left a huge void is my understanding of how the machines actually worked. One of the biggest and the first of many technological learning curves I encountered was not in the areas where a person would expect to have problems,well I didn't expect them. As I grew farther away from the new machine and closer to the antique and vintage machines. I found myself having problems keeping nice straight rows of stitches. I was fighting the material,I couldn't get a seam to lay out with out ripples or curves.No tension settings or balancing stitches seemed to help, in fact it only seemed to get worse and create other problem with the machines. 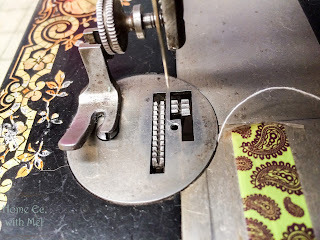 As I was really getting discouraged in my ability to out smart a thread and a chunk of Iron, I started to notice that when I would change the presser foot setting on the machine I could also change some of the problem. Since I had a limited hands on knowledge of the newer machines that would adjust presser foot pressure on the material I had no clue how to adjust it on the vintage machines. 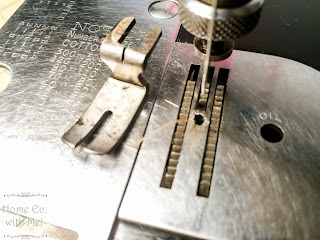 As I started understanding the relationship and adjusting the presser foot to the thickness of the materials being sewed I started to see big differences in the quality of my seams. I was on a roll. I started to pay attention to the physics involved and suddenly it was all making sense to me. It was faster than sewing by hand and easier for thicker seams but needed continual guidance to keep a seam straight, That design was quickly followed by a design that remained prevalent for a long time. This new design used a wider presser foot and two rows of parallel feed dog teeth to pull the fabric through the machine. One row of teeth was longer containing more teeth and the second row was considerably shorter,the presser foot also has a long toe on one side of the needle and a shorter toe on the other.This design allowed for better feed results on lighter fabric. It was no longer necessary to constantly guide the fabric in order to maintain a straight stitch. Its two weaknesses were at the end of the seam the fabric has a tendency to curve during the last half of an inch or so. 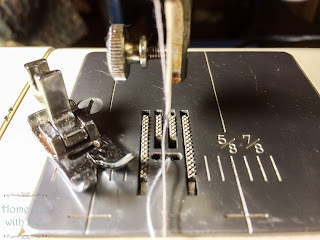 Secondly, the feature object of this blog post, if the presser foot is too tight then it tries to pull the fabric in a curve instead of feeding it straight across the bed, If it is too loose it will slip and pull in a curve the opposite direction. When it is perfect for the fabric being sewn it will effortlessly sew in a straight line with no guidance needed other than tailing the fabric. Eventually the feed dog system changed again to incorporate two parallel rows of feed dog teeth of equal length,and the presser feet toes are the same length on each side of the needle.This is the system most recognized universally today, The early models of this design was narrow with long feed dogs,and required very little guidance to keep a straight seam. it would pull the fabric evenly from the first stitch to the last. Over the years the length of the feed dogs have shortened and spread farther apart to allow a wider presser foot. This basic style of foot is still in use today. Some manufacturers are using very wide feet and two rows of teeth down each side.But the basic theory of the parallel feed has not changed in decades. 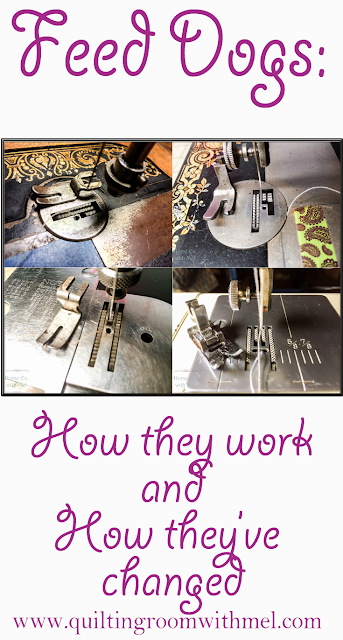 So as you can see when I jumped from a modern machine that adjusted its own presser foot pressure and fed evenly on both sides of the needle to a vintage sewing machine with off set feed dogs and a narrow base I was totally lost. It took me a while to get it all figured out and the true test of my theory has been successful. For those of you who find yourselves as frustrated as I was I hope this will help you. And those who never had this problem I salute you,bow to you and doff my cap. I hope you have found some humor in my endless efforts to overcome a simple stitch. 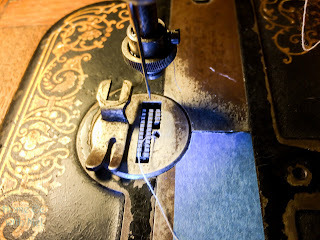 Be sure to check out our other posts about sewing machines and our treadle sewing machines.